Awarded for outstanding performance of a Chamber of Commerce / Board of Trade Manager, Managing Director, Executive Director, General Manager or CEO . one selected from a Chamber of Commerce / Board of Trade with less than 500 member organizations. one selected from a Chamber of Commerce / Board of Trade with 500-999 member organizations. one selected from a Chamber of Commerce / Board of Trade with 1000+ member organizations. Awarded for outstanding performance of a staff member of a Chamber of Commerce/Board of Trade. NOMINATION FORMS and information sheets are attached. Anyone may submit nominations. Submissions should include the information requested and nominators are encouraged to seek input from staff and Board members. Please be advised that any additional information may be included if you consider it to be relevant but it will not be returned. 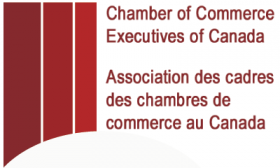 One award in each category may be presented at the Awards Banquet during the Annual General Meeting of the Chamber of Commerce Executives of Canada /Association des cadres de chambres de Commerce au Canada (CCEC/ACCCC). Click here for a list of all previous award recipients.